This kit is designed to allow venting of pressure build up inside the Sea Pump housing that could create premature failure to be released through the existing fuel pump vent system. This master kit is a rebuild service kit for the Hardin Marine stainless pump 625-4111. This kit comes with new wear plates , O-rings, seals, impeller, rear housing and retaining clip. 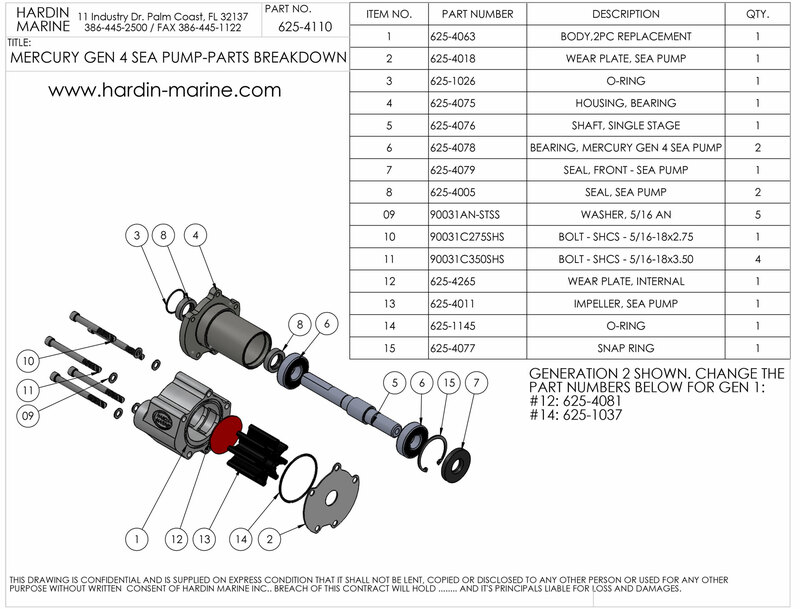 This master kit is a rebuild service kit for the Hardin Marine stainless pump 625-4110. This kit comes with new wear plates , O-rings, seals, impeller and retaining clip. Which Rebuild kit do I need? Gen. 4, Rev. 1 pumps have a 1/8" drain plug in the rear housing and a slotted front wear plate. Gen. 4, Rev. 2 pumps have no drain plug and a solid front wear plate. This master kit is a rebuild service kit for the Hardin Marine stainless impeller housing 625-4178 and stainless pump 625-4110 . This kit comes with new wear plates , O-rings, seals, impeller and retaining clip. This impeller kit is a rebuild service kit for the Hardin Marine stainless impeller housing 625-4178 and stainless pump 625-4110 . This kit comes with new wear plates , O-rings, and impeller. Gen 4. Rev. 1 pumps have a 1/8" drain plug in the rear housing and a slotted front wear plate. Gen 4. Rev. 2 pumps have no drain plug and a solid front wear plate. This impeller kit is a rebuild service kit for the Hardin Marine stainless impeller housing 625-4178 . Heavy Duty Replacement shaft for Hardin or Mercruiser Gen 4 Sea Pumps. It replaces Mercruiser OEM # 59501A1. 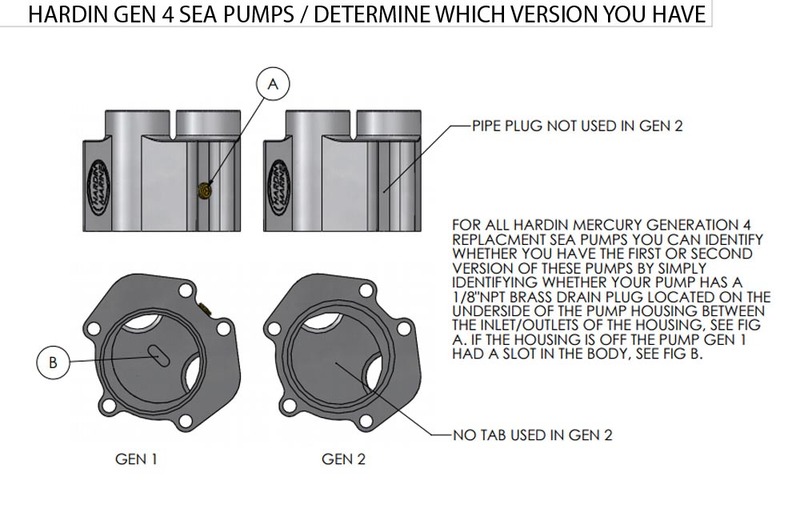 These fittings are commonly used with Hardin Marine's Lifetime Sea Pumps and Rebuild Kits.